As anticipated and hoped for Nevada Gov. Brian Sandoval (R) signed into law the state’s Solar Bill of Rights (AB 405). The bill reopens net-metering in the state and gives homeowners assurances that rates won’t change while protecting them from shady solar sales tactics, among other things. Nevada, one of the sunniest states, had a thriving solar industry until the state’s utility commission controversially halted net-metering over night. Net-metering, which credits solar-powered homeowners for the power their solar system produces, was an important incentive for consumers in choosing to go solar. By selling back power that homeowners can’t use to their utility at a fair rate, the homeowners are able to more quickly recoup any of the payments they made for the solar array and save more money in the long term. In ending the policy overnight for existing and future consumers, it disincentivized solar energy and essentially ended the state’s rooftop solar industry and cost the state roughly 2,600 jobs. Even prior to signing the legislation into law major rooftop solar installers signaled that they would reenter the market. That includes Sunrun, SolarCity and Vivint Solar. 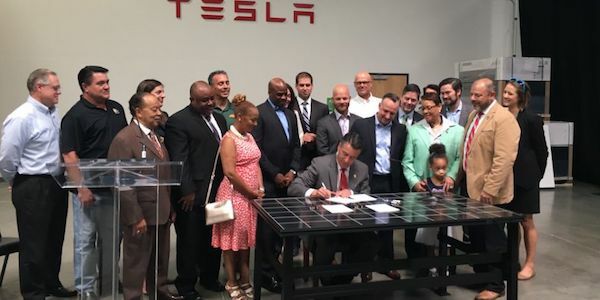 The new law is among 11 clean energy that Nevada approved this session. Other bills would increase Nevada’s renewable energy requirements to 40 percent by 2030. Another bill would establish a statewide community solar program, which will make it easier for renters and low-income families to reap the benefits of solar power. The legislators also passed bills establishing an energy storage program, increased energy efficiency investment and a new clean energy financing program, according to Vote Solar.